What Will I Learn in an Online Graduate Certificate in Health Informatics? What are the Best Online Graduate Certificate in Health Informatics Programs? What Can I Do With a Certificate in Health Informatics? With the highest growth rate of all industries, the Bureau of Labor Statistics projects the emergence of more than 9 million healthcare jobs by 2024. For those with a background in information technology or healthcare, earning a graduate certificate in health informatics online is a direct path to professional advancement. This guide details how to earn a health informatics certificate and discusses career paths available to graduates, which merge computer science with clinical technology. The following sample curriculum highlights courses common to most graduate certificate in health informatics online programs. While courses vary by program, some topics are integral to health informatics studies. Each of the following courses provides students with skills necessary for careers in health informatics. Electronic health records: Students explore components of electronic health records, including security requirements and application systems integration. Coursework emphasizes the impact of multiple users in settings such as clinics and research facilities. Students are prepared for careers as electronic health records analysts and coordinators. Healthcare informatics: This foundational course familiarizes students with biomedical technology, including information systems and data security, nuclear medicine, and ultrasound imaging. Students explore hospital process modeling and quality assessment to prepare for careers as clinical informaticists and health informatics specialists. Health data management: In addition to program planning and implementation, this course covers database systems and structured query language. Students explore the impact of emerging technology on data quality and prepare for careers as information services project coordinators and clinical research data monitors. Founded in 1839, BU is a private research institution with two downtown campuses. BU offers offers bachelor’s, master’s, doctoral, and professional degree programs and has offered online courses since 2002. BU’s online health informatics certificate program emphasizes medical data storage in public health institutions and healthcare organizations. Graduates work as information systems managers, health services managers, and information security analysts. The curriculum consists of four courses, which most students complete in 8 to 12 months. Financial aid for continuing education students is available in the form of graduate assistantships, scholarships, loans, and payment plans. Students may apply certificate credits toward BU's master's of science degree in computer information systems with a concentration in health informatics. Located in Philadelphia, Pennsylvania, Drexel is one of the largest private universities in the United States. A pioneer in online education, Drexel established its first distance learning program in 1996. Today, Drexel enrolls nearly 5,000 online students and offers more than 140 online certificate and degree programs, including the online certificate in health informatics. The certificate program requires three courses and shortens completion time by operating on a quarter system, rather than a semester system, which allows students to take more courses per year. Applicants must have a bachelor’s degree from a regionally accredited college or university. Drexel alumni, military members, and members of partner organizations may be eligible for discounted tuition rates. USF offers online bachelor’s, master’s, and certificate programs, including a graduate certificate in health informatics. The certificate program is ideal for health industry professionals who want to advance their career by learning how medical data is stored, organized, and secured. The flexible program allows students to earn a graduate certificate in health informatics online in as few as eight months. Students who choose to continue their education may apply all 12 credits earned from the certificate program toward a master's degree. Applicants must have a bachelor’s degree from a regionally accredited university, a 3.0 cumulative GPA, and a 3.0 GPA in the sciences. Established in 1839, Mizzou is the oldest public higher learning institution west of the Mississippi. The university offers more than 300 degree programs, including an online graduate certificate in health informatics program. Students who take one or two courses per semester typically complete the 12-credit certificate program in about a year. In addition to information technology and data storage, Mizzou’s program covers policy issues and controversies associated with data security. Students of the blended certificate program are required to visit campus for weekend events. All students completing the graduate certificate in health informatics online qualify for in-state tuition rates, and three out of four Mizzou students receive financial aid. UMass Lowell is a public research institution that offers more than 170 bachelor’s, master’s, and doctoral programs, including blended and entirely online programs. The online graduate certificate program in health informatics may be completed fully online, with no on-campus requirements. The program comprises four courses, each of which takes 10 to 14 weeks to complete. Students in the health informatics certificate program complete two required courses and two electives. Students typically study 6 to 10 hours per week, per course, but students may work through the curriculum at their desired pace. UMass Lowell offers grants, scholarships, and loans to continuing education students. CSS is a private, Catholic-affiliated college with eight campuses throughout Minnesota. The college has grown rapidly during the last decade; the undergraduate and graduate student population has nearly doubled, and CSS has expanded its online and weekend offerings. The health informatics certificate requires six courses, including a course on medical vocabulary. Students generally complete the program in three semesters or fewer, provided they have already completed the prerequisite course in statistics. CSS provides online students with small class sizes and individual attention from professors. Some courses are taught synchronously through Adobe Connect, which uses video conferencing to mimic an in-person classroom experience. Established in 1877, Regis is a Jesuit-affiliated private university located in Denver, Colorado. Regis provides flexible continuing education programs, both in the Mile-High City and online. The university offers more than 100 online programs, including a post-bachelor’s certificate in healthcare informatics. Each of the program's four required courses takes eight weeks to complete, and a fifth course in database architecture is recommended. Students earning their graduate certificate in health informatics online may work at their own pace, as long as they complete weekly assignments. Applicants should have a 3.0 GPA from an accredited university, but those with a lower GPA will be considered on a case-by-case basis. In addition, Regis prefers applicants who have worked two to three years in the healthcare industry. Founded as an all-female liberal arts college in 1932, USJ now offers a variety of coeducational graduate and certificate programs. USJ's flexible online programs are interactive and writing-intensive, ideal for continuing education students. The health informatics graduate certificate program prepares students to manage medical data systems and make data-driven decisions in the healthcare industry. Each of the four required courses takes seven to eight weeks to complete and can be applied toward the USJ's master's in business program. Coursework is delivered asynchronously, through recorded lectures, enabling students to attend class at their convenience. USJ's online programs are not available to students residing in Arkansas, Alabama, or Minnesota. With a mission of providing "innovation for a healthier planet," UNE is Maine’s only medical and dental school, offering programs in pharmacy, nursing, and other areas of healthcare. The school's totally asynchronous online programs include a graduate certificate in health informatics program. The certificate requires six courses, which students typically complete in one year. However, ambitious students may complete the program in half the time by accelerating their studies. The program covers the inner workings of medical data systems and teachest students project management and leadership skills. Applications are accepted on a rolling basis, and start dates are available in spring, summer, and fall. Misericordia is a Catholic liberal arts institution situated on a 123-acre campus in Dallas, Pennsylvania. Misericordia offers 37 degree programs and 16 certificate programs, including a hybrid healthcare informatics certificate provided through the Center for Adult and Continuing Education. The certificate is ideal for healthcare or information technology professionals who wish to advance their careers. Most students complete the six required courses in one year. Unlike most health informatics programs, Misericordia’s program covers finance and business topics as they relate to medical data systems. While coursework is completed mostly online, the hybrid program does requires some campus visits. Graduates with a health informatics certificate pursue a variety of IT careers within the healthcare industry, such as data analysis and network design. With an emphasis on medical computer and network systems, training in health informatics equips students with knowledge of network security and project planning. Most health informatics occupations require strong analytical and communication skills, attention to detail, and ingenuity. Health informatics professionals often work long hours and are on call during nights and weekends. Computer and information systems managers direct an organization's computer systems. They assess a medical facility's computer needs, plan the installation of computer hardware and software, and ensure medical files are secure. By designing and building data communication networks and predicting future network needs, computer network architects ensure that medical facilities have the connections they need to operate efficiently. As confidential patient material is increasingly digitized, the need for network systems protection grows. These professionals serve as intermediaries between stored data and user access. Database administrators prevent unauthorized access to patient files and develop databases to meet the needs of a medical organization's users. Information security analysts implement security measures, such as firewalls and data encryption programs, to protect patient data. These professionals organize, install, and maintain a medical facility's computer systems. They also perform data collection for network optimization and oversee user training and support. Systems administrators often work with network architects to design network models. Earning a graduate certificate in health informatics online from an accredited institution guarantees an education that is in line with national standards. Credits from an accredited program transfer more easily, and many employers prefer candidates with a certificate from an accredited school. The two major types of U.S. accreditation are regional and national. More than three-quarters of American colleges are regionally accredited, and many professional licensing organizations require applicants to have a degree from a regionally accredited university. While nationally accredited schools offer lower tuition rates and more lenient admissions requirements, earned credits rarely transfer to regionally accredited schools. Program-specific accrediting bodies monitor curricula, learning outcomes, and diversity practices. 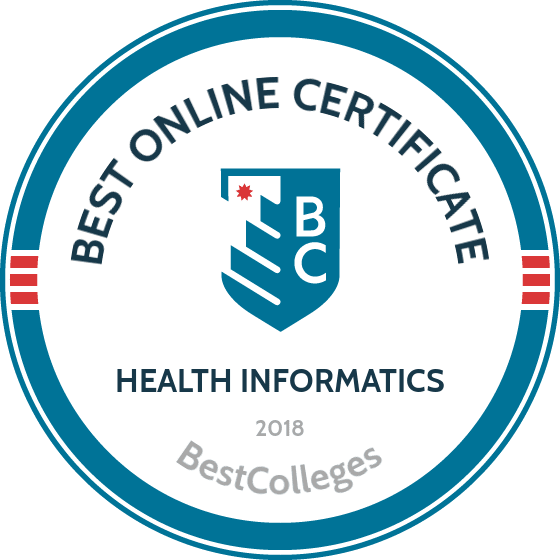 Health informatics certificate programs are accredited by the American Medical Informatics Association and the Commission on Accreditation for Health Informatics and Information Management Education. In addition to program-specific accreditation, students pursuing a health informatics certificate online should search for programs accredited by the Distance Education Accrediting Commission. Scholarships through colleges, organizations, and private donors are some of the best options for financing a health informatics certificate. Grants and scholarships do not require repayment, and students pursuing their graduate certificate in health informatics have access to a variety of field-specific scholarship opportunities. Students may also apply for federal, state, and private loans. Complete the FAFSA to determine federal loan eligibility.